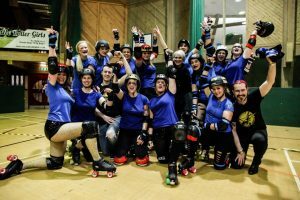 As summer claimed to rear its head in the distance, the Newcastle Roller Girls were aiming to close Spring in good form with another double-header of action as they hosted the girls from the Lincolnshire Bombers at Nevermind The Backblocks. For NRG, these bouts would be particularly interesting, as it was only in August of last year that the Hinnies faced the Damebusters, but the Hinnies now are almost unrecognisable both in terms of individuals, and as a team, following some good recent results. Several of the girls playing now were fresh starters at the last meeting, if with NRG at all. But the presence of seasoned players such as Levine Dead, Indijo, Guinefear of Jamelot, Blackjack Belle and A-Kay provide a backbone of experience to the team. In terms of outgoings, sadly this will be the final bout for Méli McSly at NRG, as she prepares to leave for Paris. For the Damebusters, news that their preparation was disrupted by their coach company was not welcomed, and both sides were hoping that a solid, focussed game would still be on the horizon: they need not have worried. As the bout kicked into action, each side traded blows of fours, with Guinefear, Penny Bizarre and Hot Whips claiming the points for the Hinnies, and Jo responding for the Damebusters. But things began to heat up in the fifth jam, when a collision between Hannihilation and Guinefear sent both players to the floor, and the NRG jammer to the bin, quickly followed by McSly for her attempts to slow Jo’s progress. The Lincolnshire jammer managed to evade Indijo twice before an enormous block from the NRG put an end to her efforts after grabbing 13 points; 12-17. Three more close fought jams followed, neither side gaining more than five points, until NRG surged into action in the ninth outing. With key blockers for both teams – Levine Dead and Hannihilation – starting in the bin, both Hot Whips and Jo easily broke through the pack, Hot Whips taking lead as Jo cut track in the process. With the NRG outside line causing problems for the visitors, Lincolnshire thought they had plugged the gap for Hot Whips, until a fantastic piece of bulldozing from McSly sent the Bombers wall hurtling, creating a jammer-shaped hole for Hot Whips to slip through. The jammer was only eventually brought to a halt on her final pass at the hands of a huge hit from Fish; 37-19. Confusion struck the NRG blockers in the twelfth jam as the referees called a much-debated no pack. Fish duly took advantage to slip through unnoticed to claim 4 points for the Bombers; bringing the score to 40-24. This seemed to spark more action from the hometeam, and Penny Bizarre was granted a power jam within seconds of the start of the thirteenth jam. Lincolnshire made things difficult for themselves, with Kat-titude starting in the bin, and quickly being followed by Hayley and Twinkle von Doom alongside their jammer. Penny Bizarre certainly took advantage, helped by the marshalling of their own wall by A-Kay, NRG eased their jammer through to pick up a huge 34 points, pushing the score to 74-28. But Lincolnshire certainly didn’t make it easy for their opponents at the end of the first half. In fact, the final four jams saw NRG fail to break through for a single point, whilst Jo, Twisted Innocence and Smashlight Express brought their total up to 31. The seventeenth, and final jam of the half brought a great effort from Jo, dodging through a spread-out NRG wall, who eventually had Levine Dead and jammer Penny Bizarre sent to the bins. The Lincolnshire jammer was slowed by McSly and Blackjack, before the latter made an enormous block to send Jo off the track, having picked up 14 points for the visitors. The first jam of the second half saw the Lincolnshire stamp a sign of determination on the game. With Penny Bizarre and Levine Dead starting in the bin, Fish takes the ascendency, grabbing 10 quick points before calling the jam off. But yet again, the Hinnies only saw this as a cue to cause more damage. Dollface Dynamo took to the track in the third jam and burst through the Lincolnshire wall easily for lead, helped by a big block on jammer Fish by Blackjack. As Dollface continued to pass through the pack, Fish’s task was made near impossible by some good defensive work from McSly and Elizadeath Benhurt, although McSly would eventually be sent to the bin for a block out of bounds on the jammer; 89-55. The scores stayed fairly similar for the following five jams, although the Hinnies eventually broke the 100-point barrier in the eighth outing. But a fightback rose from the visiting team in the ninth jam, where the Hinnies wall seemed to be frustrating jammer Jo for a long way around the track, until she brilliantly burst through a minuscule gap, surviving a giant hit from Levine Dead in the process. In their efforts to stop the jammer, Indijo, Dollface and Levine Dead were sent to the bins, and a good few laps from Jo ultimately brought home a 24 point jam; 101-85. The Hinnies tightened their defences once more following this lapse, however, with the hard work of La Dolce Beater, Carm Like A Bomb, Cherry Vaudevillain, Levine Dead and A-Kay preventing any Lincolnshire points for the next three jams. As the bout started to come to a close, the home team threw their efforts into securing the result, and a bit of a tasty thirteenth jam was the culmination of this. As Indijo and Jo faced off, both jammers flew through the pack, although neither managed to claim lead. A big block from Guns halted the progress of Indijo, whereas Hit One Purl One landed a similar on Jo. A great effort by Indijo somehow saw her bring in 11 points, despite taking another massive hit from Smashlight Express, whereas some stoic walling from McSly and Levine Dead limited Jo’s efforts to 10; 115-95. With two minutes remaining, the Hinnies withstood a terrific effort from the visitors, as the Lincolnshire wall prevented all but Fish from breaking through. However, the Bombers jammer was only able to add a further 4 points to the total. As the fifteenth and final jam began, the Hinnies finally wrapped up victory, with McSly shutting jammer Twisted Innocence out of the contest, and Hot Whips snatched at 5 more points. A very hard fought bout finally coming to a close after a nerve-jangling conclusion.